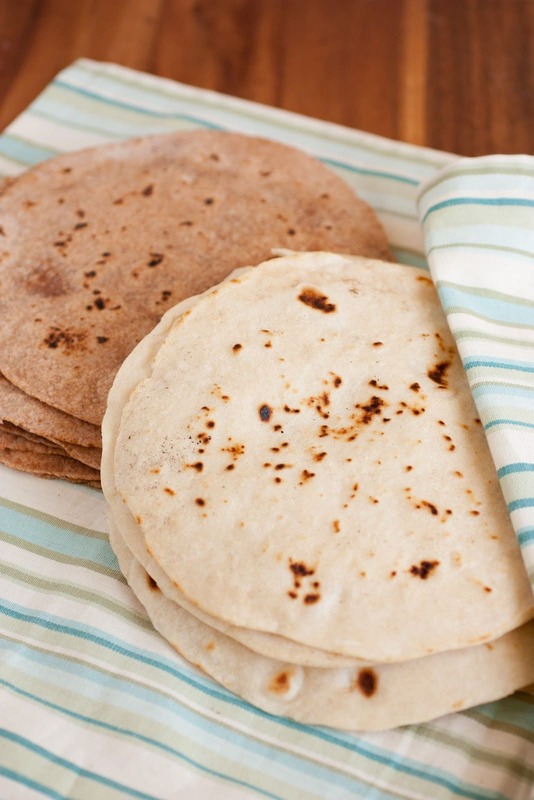 These homemade tortillas are a definite highlight of a Mexican meal. Here you’ll learn how to make simple homemade tortillas, they are 100 times better than store-bought! If you ask me, made from scratch Mexican food is just about as good as it gets. I’ve mentioned before that Mexican and Italian food are my two favorite kinds of food. 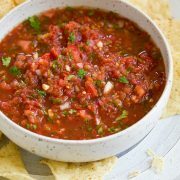 One thing I love about each of them (other than the number one reason – the incredibly delicious flavors) is their use of so many fresh ingredients and how a lot of it is made from scratch. I’ve been to Mexico just a few times and one of my favorite things there was always the homemade tortillas. I loved stopping by the market to get a bag filled with a large stack of fresh flour tortillas from the bakery (I loved the fresh churros they have too, mmmm). I could probably eat that whole stack of homemade tortillas in one sitting. Homemade Tortillas are so Worth it! These may seem like one of those things that’s not worth the time and effort but I’m telling you, it is! I just don’t like the flour tortillas from the store that are pre-made and loaded with preservatives, they just taste weird to me. Once you’ve had fresh tortillas, you know what I mean when I say homemade tortillas and store-bought ones aren’t the same thing at all. There is the uncooked version you can get in the refrigerated section of the grocery store (which is what I use when I don’t have time to make them from scratch) which are undoubtedly so much better than those you get on the shelf. Then several steps up from those are the homemade version. The tortilla is the first thing your going to bite into after all, so it better be good right? 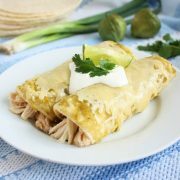 Enjoy this homemade tortilla recipe! In a large mixing bowl, whisk together flour, salt and baking powder. Using your hands, rub the shortening into the flour mixture until evenly distributed (mixture should hold its shape when clamped between your hands). Pour in 1 cup water and use a wooden spoon to stir until mixture comes together, adding additional water as needed (I used 1 cup + 2 Tbsp water). Knead mixture by hand until smooth (I just did this in the bowl). Divide mixture into 8 equal portions and shape each portion into a ball. Cover dough balls with plastic wrap and let rest at least 30 minutes and up to 1 hour. Roll each ball out on a lightly floured surface into a 10-inch circle (for a nice circular form flatten ball slightly then roll in one direction, make a 1/6 turn roll again, make another 1/6 turn and roll again. Continue to roll and turn until your dough circle is about 10-inches across). Heat a large non-stick skillet over medium high heat. Place rolled tortilla in hot skillet and cook until bubbles begin to appear on the surface, then flip tortilla to opposite side and cook until golden brown spots begin to appear on bottom. Immediately transfer cooked tortilla to a large Ziploc bag and seal bag (or tuck the opening underneath that way you wont keep on zipping and unzipping the bag as you work). Repeat process with remaining tortillas. 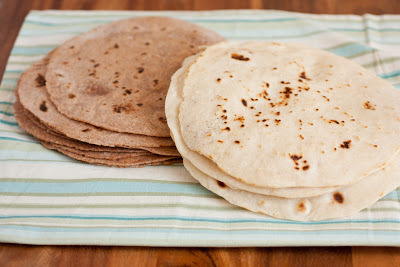 Tortillas can be stored in an airtight container at room temperature for about 2 days or in refrigerator up to 1 week. In a large mixing bowl whisk together flour, salt and baking powder. Using your hands, rub shortening into flour mixture until evenly distributed, about 1 minute. Add in canola oil and mix with your hands until evenly distributed. Mix in optional sesame seeds. Pour 1 1/4 cups hot water into mixture and mix with a wooden spoon until mixture starts to come together, adding additional water as needed, then knead by hand until smooth. Divide dough into 10 equal portions and shape each portion into a ball. Cover with plastic wrap and let rest at least 30 minutes or up to 1 hour. Immediately transfer cooked tortilla to a large Ziploc bag and seal bag (or tuck the opening underneath that way you wont keep on zipping and unzipping the bag as you work then seal it shut when finished). Repeat process with remaining tortillas. Tortillas can be stored in an airtight container at room temperature for about 2 days or refrigerated up to 1 week.